your inbox here is full so I can't reply to your PM. I became a member of the DPF a little more than a year ago. It's just been in the last month, that I have being logging on and getting familiar with the web site. Lots of nice people here!! I look forward to making some new friends. Happy Holidays everyone!! To Whom It May Concern, I need instruction on how to post a Thread. Thank You. Hello. I need instruction on how to post threads. thank you. Hello all. I am looking for the Disney 56th Anniversary pin. Thank you. ...is it necessary to have purchased a ticket for D23, in order to shop the vendors? I am very pleased to be a part of this website. Thank you, Josh, for making me aware of it. I started collecting Disney pins two years ago, and I have so much to learn. An example is: learning about this website, this week. I am feeling a little overwhelmed, because this is another learning-curve for me. So, any advice other members might have on how to use this website, would be greatly appreciated. Thank you, and "May the Force be with us ALL"
P.S. to any of you members who are attending D23 this weekend...HAVE A WONDERFUL, AND MAGICAL TIME. Oh, and PLEASE, share your experiences with us. 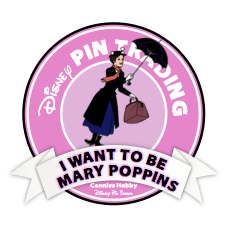 I enjoy trading with other Disney Pin Hobbyist's. Sleeping beauty pin pick ups - so grateful for Connie shipping internationally! Thank you! Great communication. Great member of the DPF community. Sleeping beauty event pick up. Awesome. great communication and fast ship.